JALLAGAZ is a dry digestion solution that makes it possible to valorize cattle, carpin and ovine manure that can be stacked as well as waste crops or cuts that have a dry matter greater than 25%. The organic materials to be treated are stored in digesters whose are in the form of a garage container. Methania designs and builds biogas organic waste recovery facilities. Our mission is to make biogas solutions accessible to as many people as possible. We design, produce and install tailor-made biogas production and upgrading solutions that are robust and efficient at a cost that delivers the best value for money. We have developed a dry digestion solution for agricultural waste called JALLAGAZ. JALLAGAZ is a solution that makes it possible to valorize the manure of cattle, carpin and ovine stackable as well as the waste of cultures or cuts which have a dry matter higher than 25%. The organic materials to be treated are stored in digesters whose are in the form of a garage container. The waste is activated by spraying a percolate under anaerobic conditions (absence of oxygen) and heated to 37-40°C. The percolate is circulated by means of a pump drawing from a reservoir of percolation liquid, and this, during a residence time of 45 days. 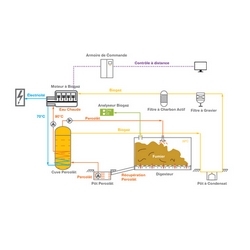 The biogas is drawn by pipes and then used as fuel in a cogeneration module (biogas engine) to produce three-phase electricity and hot water at 90 ° C.
The operation, fully automated, is carried out under supervision.